What's Standard Form of a Linear Equation? A linear equation can be written in many different forms, and each of them is quite useful! One of these is standard form. Watch this tutorial and learn the standard form for a linear equation! 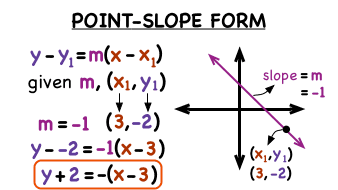 How Do You Write an Equation of a Line in Point-Slope Form If You Have the Slope and One Point? Trying to write an equation in point-slope form? Got a point on the line and the slope? Plug those values correctly into the point-slope form of a line and you'll have your answer! Watch this tutorial to get all the details!